Home prices, including distressed sales, are up 2.1 percent month-over-month and 6.7 percent year-over-year. Alaska, Colorado, Hawaii, Louisiana, North Carolina, Nebraska, New York, Oklahoma, Oregon, Tennessee, Texas and Washington reached new highs in March with year-over-year increases that ranged from 2.6 to 13 percent. According to CoreLogic's market condition evaluations, San Diego and, surprisingly, San Francisco are undervalued. Home prices, including distressed sales, increased 2.1 percent month-over-month and 6.7 percent year-over-year, according to CoreLogic’s March U.S. Home Price Insights Report. The numbers stay the same month-over-month and dip down to a 6.6 percent year-over-year increase when distressed sales are taken out of the equation. March marks the 49th consecutive month of month-over-month increases, although the increases are no longer in the double digits. Alaska, Colorado, Hawaii, Louisiana, North Carolina, Nebraska, New York, Oklahoma, Oregon, Tennessee, Texas and Washington reached new highs in March with year-over-year increases that ranged from 2.6 to 13 percent. Furthermore, no states experienced negative home price appreciation. @CoreLogic:Home prices increased 2.1 percent m-o-m and 6.7 percent y-o-y in March. 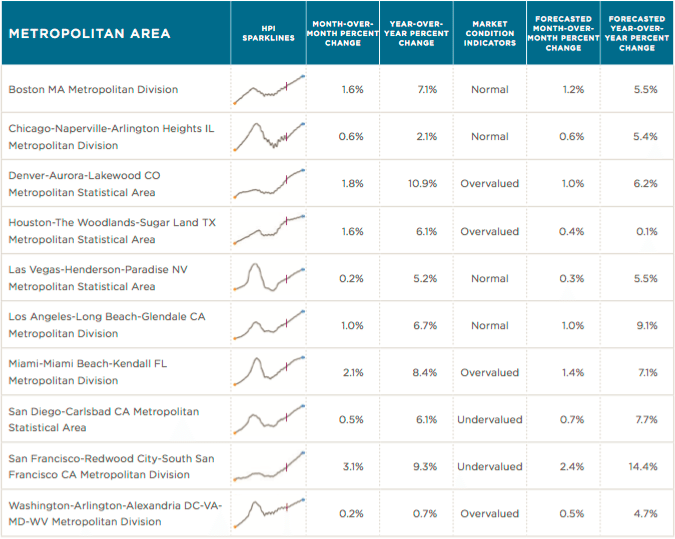 When it comes to CoreLogic’s market condition evaluations, Boston, Chicago, Las Vegas and Los Angeles are considered normal, and Denver, Houston, Miami, and Washington D.C., are placed into the overvalued range. San Diego and, surprisingly, San Francisco, are undervalued. As far as next year’s numbers, CoreLogic is predicting that national single-family home prices will reach a new peak in April 2017 with a 5.3 percent year-over-year increase. @CoreLogic’s prediction for 2017: 5.3% increase in y-o-y home prices. “Housing helped keep U.S. economic growth afloat in the first quarter of 2016 as residential investment recorded its strongest gain since the end of 2012,” said CoreLogic Chief Economist Dr. Frank Nothaft.